You'll be £8.00 closer to your next £10.00 credit when you purchase Fighting Nazi Occupation. What's this? A major reassessment of the plans to organise guerrilla warfare and longer-term resistance in the case of a Nazi invasion of Britain. It tells the story of competition by the Secret Intelligence Service (M16) and War Office to organise irregular warfare in the country and the result is a new vision of the murky and machiavellian world of wartime British intelligence. The study includes new insights into the, much misunderstood, War Office Auxiliary Units and the wider role of the Home Guard in secret warfare. This is also the first substantial publication of one of the Second World War’s last, and best-kept, secrets - the existence of an ultra-secret resistance network organised by SIS and continuing in operation for most of the war. Malcolm Atkin’s conclusions will cause controversy among military historians and will change our understanding of preparations made in Britain for Nazi occupation in the Second World War. 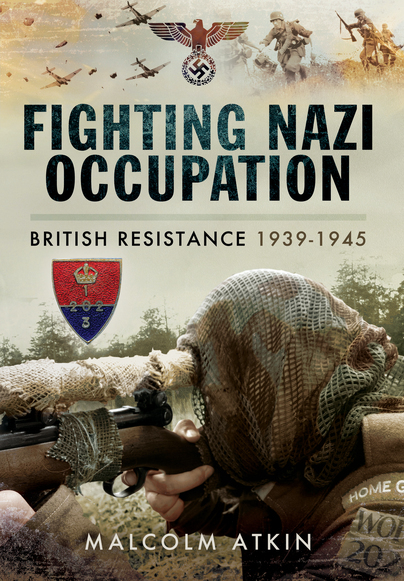 This detailed yet accessible historical study documents Britain’s resistance to Nazi occupation, with special focus on the creation of secret organizations known as The Auxiliary Units, as well as the conflict between Britain’s Secret Intelligence Service and the War Office and their debates over arming citizens and guerilla warfare. Going against current scholarly opinion, the author argues that The Auxiliary Units were intended as a short-term guerrilla force, and further argues that the Special Duties Branch of The Auxiliary Units was intended to spy on the British public. The book relies on primary source documents and includes b&w historical photos, documents, and posters.